In our household, whenever anyone feels a cold or the flu coming on, we immediately plan on making this incredibly comforting soup. We’re not sure if it’s the steamy warmth of the garlic broth, the satisfying tortellini pasta, or merely the time-tested notion that consuming copious amounts of fluids will get you feeling better straight away. Whatever the reason, this nourishing soup will help to have you well on your way to recovery. 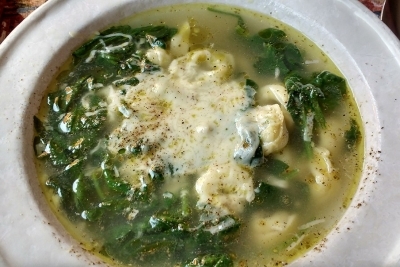 It begins with a robust garlic broth that imparts dynamic flavor to all the other ingredients. Eight-to-ten garlic cloves might seem like a lot (I sometimes use more! ), but the simmering process mellows the otherwise biting taste of fresh garlic and results in a delightfully savory background that adds a flavorful boost to all the other ingredients. I also add in anchovy paste when sautéing the garlic, which infuses the broth with that all-important umami flavor, but which can be omitted if you prefer a vegetarian soup. And, don’t think that you have to wait until you feel that you’re coming down with something to appreciate this soup. Because we love it so much, we have it year round so as not to completely associate it with the cold and flu season. Whatever your motivation, do try this easy and gratifying recipe that will help to make and keep you healthy! Heat olive oil in a large soup pot over medium heat. Add garlic, then anchovy paste (if using), and sauté, about 1 minute. Slowly add the stock, water, and salt and bring to a boil. Reduce the heat to low, cover, and simmer for about 10 minutes. While the broth is simmering, bring a large pot of salted water to a boil and cook the tortellini 1-to-2 minutes less than stated on the package directions, then drain. Once the garlic broth is done simmering, add the greens and cook until just wilted, about 1-to-2 minutes for most greens. Add in cooked tortellini and stir to combine all ingredients. To serve, ladle into wide soup bowls and sprinkle with grated parmesan cheese and freshly ground black pepper.